Resurrection! We have celebrated Easter and the resurrection of our Lord Jesus Christ just a few weeks ago. What a wonderful time of the year when we celebrate the victory of rising from the dead. We rejoice – Alleluia! Our world is going through a period of resurrection too. As we look around us we see new life everywhere as Spring has come once again. A few weeks ago I took a ride out to Dentdale. This is one of the secret, hidden Dales and I approached it from Ingleton on the white knuckle ride through the Dale. It is quite an amazing place with one side of the Dale dark and moorland and hills and the other lush and green. As I went along I saw a lot of new life, lambs gambolling in the fields and daffodils, primroses and other wayside flowers. It was a sunny and warm day and in Dent I took a walk to enjoy that beautiful creation. Two weeks later I went to Hawes via Wharfedale and from Hubberholme over the top to Hawes. I had lunch there at the famous Wensleydale Creamery and then went to Aysgarth. Again I went walking. First alongside the river to the middle and upper falls and again it was a warm and sunny day. I then left the river and walked up to the top of the fields and on an old railway track. I saw two of my favourite Springtime flowers. The bluebells in a small wooded area, very reminiscent of childhood in Hardcastle Crags, and then a much more rare wayside flower, the cowslip. How beautiful the cowslip is and not often seen in these parts to-day. Now the daffodils have died down, the bluebells are fading but another flower is out in great profusion. A very beautiful and versatile flower – most of you will call it a weed – THE DANDELION, the dauntless dandelion!!!! The dandelion is bright, beautiful, it is seen in great numbers, it changes into the “clock” and spreads itself on the wind and grows somewhere else. I thought about that dauntless dandelion and thought how wonderful it would be if we as Christians could be more like it. We should be bright and beautiful, we should spread ourselves everywhere, we should do that quietly but effectively. Are we spreading the Christian Gospel everywhere we can or are we being dug up and put on the compost heap. I hope for all of you the love of Christ, and that as Christians we can tell the world about the Resurrection of Christ, not just at Easter but always. Sunday, 12th October, 2003 – The service led by Rev. Lisa Quarmby included the dedication of Pastoral Visitors – Irene Cunliffe, Mary Dixon, Una Gill and Mavis Wilkinson. Sunday, 30th November, 2003 – Advent Sunday when the first candle was lit by MaryDixon. Candles were lit on subsequent Sundays by Stephen Illingworth, Una Gill and Irene Cunliffe. Sunday, 21st December, 2003 – Carol Service led by Rev. Lisa Quarmby. Taking part were Stephen Illingworth, Mavis Wilkinson, Una Gill, Mary Dixon, Gordon Wilkinson, Marjorie Spaven and Charlotte. Seven carols were sung, the organist being Stephen Illingworth. Collections amounted to £133.81p. and a retiring collection for NCH amounted to £61.19p. Sunday, 28th December, 2003 – a joint service with friends from Mount Tabor and Illingworth Moor led by Rev. Lisa Quarmby with Stephen on the organ. Nine carols chosen by members of the congregation were sung, explanations being given as to why they were favourites although not so frequently sung. Collections for NCH amounted to £105.50p. Sunday, 4th January, 2004 – Covenant Service. Thursday, 1st April, 2004 – The First Ladies Fellowship meeting was held at 6 BrantAvenue. Ten ladies attended and plans were made for the months ahead. Sunday, 4th April, 2004 – Friends from Illingworth Moor held their first service at Mount Zion which took the form of a family service and Parade. They are very welcome and we hope they will enjoy worshipping at Mount Zion whilst their new Church is being built. We wish them well in their new building which they hope will be opened at the beginning of October, 2004. Maundy Thursday, 8th April and Good Friday, 9th April, 2004 – Rev. Lisa Quarmby led services at Mount Zion for members of the three Churches she has pastoral oversight of. Easter Sunday, 11th April, 2004 – Rev. Lisa Quarmby led the service during which Stuart and Jill McArthur were received into membership of the Methodist Church. They have attended Mount Zion for some time and we are very happy to welcome them into the Church Family as members. Stephen Illingworth was the organist and collections amounted to £62. Easter Offering Envelopes contained £35.50p. for World Church Funds. Heritage Matters . . . There is very little to report since the last edition of “The Dial” as it is our closed season. We are now in the process of getting quotations for the end walls of the Chapel and Cottage to be re-limewashed. We are hoping to get it done during the better weather. Some people have asked why we don’t have it done with one of the new acrylic type paints but that is not approved of by English Heritage. They stipulate three coats of limewash. This is to preserve the building. If modern acrylic paints are used the water seeps down behind it from the upper part of the building and then accumulates at the bottom causing the dampness to go inside the building and cause problems. 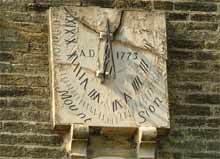 We are also still on the trail of having the sundial repaired but that is more complicated. Watch this space. We have had a full risk assessment on the buildings and graveyard and we are most grateful to Mr. Anthony Greenwood for doing that for us and for putting up handrails, notices, etc. October, 2004 is the date on which we have to be seen to be providing facilities for disabled users. We have submitted a sketch and photograph of the outside toilet which we are hoping can be adapted for wheelchair users and people with mobility difficulties. Again, watch this space!! In February, 2004, I went to the Archives and History Committee and Heritage Forum. This year we met at Brunswick Methodist Church, Newcastle-upon-Tyne. It was a very interesting visit. After the first part of the meeting we did a tour of the sites in Newcastle City Centre. We went to one of the main shopping streets and saw site where the Orphan House had been, we went to the Literary and Philosophical Society building where the Methodist Archive is kept and then down on to the waterfront where we saw a fountain and a mural on the wall all relating to Wesley. It was good to see the bridges, especially the “winking eye”, although it did not operate when we were there. We then climbed back up to Brunswick and completed the meeting. I had not been to Newcastle before and found the experience very rewarding. Next year we meet at Mount Zion. Help will be needed for catering!!!! The Mytholmroyd Historical Society members had their summer outing to Mount Zion on 15th May, 2004. I had spoken at the Historical Society Meeting about Mount Zion and the Hird Collection and last year spoke at the Hebden Bridge Historical Society about Wesley and the Calder Valley. As a result it was suggested that one of the summer outings could be to Mount Zion. It was a lovely evening, quite balmy for Mount Zion and they thoroughly enjoyed the evening. One of the things which was said to me afterwards by so many of the visitors was how well-loved Mount Zion must be to be in the condition it is. They felt it was warm and welcoming. Actually their visit coincided with the heating being on in both Chapel and Cottage. It is set to come on for about one hour each day and that is early evening!!!!!!!!! Rev. Donald Ryan has visited on a number of occasions to re-catalogue the Hird Collection. A bound annotated catalogue will be published in the near future. This will be a large publication as the Hird Collection contains a great number of items. Donald photographed and measured all the items and needed to do this outside. It proved to be a very exciting and challenging job. The first day it was dry but very windy and as all the artefacts in the reserve collection are covered with acid free tissue it was difficult keeping hold of the paper and keeping the ceramics still --what did we do before blu-tack. They are all kept in the prophets chamber, so that entailed a lot of step work. Thanks go to Donald for all his hard work in doing this cataloguing. It will be interesting to see the finished article. We are looking forward to the Open Days this season which are on Saturday 19th June, 17th July, 21st August and 18th September and for the Heritage Open Days, on the Saturday 11th September we shall be open from 2 p.m. to 4 p.m. We cannot open on the Sunday because the building is being used for worship by Illingworth Moor. PEOPLE . . . .
GORDON MADDY – It is with great sadness that we record the death of Gordon Maddy. Gordon and Doreen were very much part of Mount Zion whilst Doreen played the organ for us once each month. Gordon was very solicitous in caring for Doreen . He brought her into Church and sat with her during the service. We were indeed sorry when we learned of his illness and the subsequent time of various treatments. Gordon was a very accomplished man in many ways. He was a great musician and had a love of brass instruments through his, and his family’s, long association with the Salvation Army. He was very accomplished also in his work with wood. I remember him showing me a wonderful train engine he had made from wood for his grandson, Christopher. He was above all a very committed Christian whose faith shone through his life and especially through his positive approach to his illness. He will be very sadly missed and our condolences go to Doreen and to the family and we wish Doreen well in her new home. GEORGE YATES – We were shocked to hear of the untimely death of George after a short illness. George had shown a great interest in Mount Zion. He was an avid historian and collector of all sorts of things, especially Wesleyana, and came to Mount Zion open days and gave to us a number of things. One of these was the lovely autograph album which we have on display on Open Days. George was originally a member at Bethel, Ovenden, but on his marriage to Susan (daughter of Gladney and Freda Robinson of Illingworth Moor) they went to live in Brighouse where they attended Lane Head and then Central. Our condolences and sympathy go to Susan and all the family. JACK ILLINGWORTH – We were sorry to hear that Jack had to have surgery for cancer in his mouth and face shortly after Christmas. At the moment he is completing radiotherapy treatment so is quite unwell. We all send him our greetings and assure him of our prayers. We trust that the surgery and treatment will mean that he will recover and once again come and join us at Mount Zion. Our greetings also go to Stephen who cares for Jack at the moment and to Charlotte and her family too. TREVOR HOYLE – Trevor underwent further surgery on his hip but he is now out and about – dancing, etc. We are glad to see that he is recovering well and send him our greetings. PAT VARNEY – Pat had a hip replacement just about a year ago but now needs to have the other hip done and we hope that she will soon be able to have that and will then have a better quality of life and can eventually throw away that stick. All good wishes to her. STUART AND JILL MCARTHUR (supported by ALICE) – Congratulations on becoming Members of the Methodist Church. We re-welcome you to our Church Family. You have been part of it for a long time and we are really pleased that you have taken the step of becoming members. Stuart has submitted a “free” item to “The Dial” which you will read later. This is a special year for the big ‘0’s – Mavis Wilkinson, Mary Ayrton, Mary Dixon, Ros Greenwood, Dennis Fryer, Betty Jagger, John Lambert – 60’s, 70’s, 80’s – I’ll leave it to you to work out which for each!!!!!!!!!!!! Thanks for the parties, etc. Sorry we did not get an invite to Kenya with John and Sue, but you can’t have everything. I think Mavis will still be celebrating when she is 90 as things are going!!!!!! Greetings, congratulations and good wishes for many years to come. Remembering . . . . I remember the Sunday School Anniversaries in the early 1930’s when the scholars “Sat Up”. This entailed erecting a platform of trestles between the Pulpit and the front pews. Benches were placed at the back covered in red cloth, these for the older scholars, a row of small chairs in front and another of smaller chairs for the tots. Looking back it must have been a rather Heath Robinson arrangement, although I don’t recall anyone falling off – maybe a few near misses!!! Of course, we were all in best summer dresses, white socks and shiny shoes. After assembling in the Sunday School we marched along to Chapel, older scholars leading and youngest tripping on behind. Except when it rained. In that case the teachers would shepherd two or three at a time, under large umbrellas, hoping we did not get too wet. Getting onto the platform was not easy either, no secure steps, just a chair to stand on, and a helping hand to give the necessary “leg up”. We sat self-consciously, knowing we were on show. After we had sung the hymn which we had practised for weeks, we could relax a little. I am sure we did not keep still and quiet for the rest of the service. With family and friends in the congregation all admiring “our Johnny” or “our Jane”, and noting how so-and-so’s ribbon was loose, or one child pulling faces at another, the preacher would not have the most attentive of listeners. A few words to us, prayers, another hymn, the grace and dismissal – then it was all over for another year. Outside once again it was “race you over the gravestones back to Sunday School – ready… steady… go! – that is unless the teachers caught us first. Thanks to Mary Dixon for this. Those halcyon days of long ago when children had much more freedom. To-day the platform would be a Health and Safety issue and running over the gravestones would not be an adventure but a hazard. How do people find us ??? It is amazing why people come to join us at Mount Zion. Marie and Lesley Hollingworth saw that we had afternoon services as they passed the Church quite often and thought they would come in. They have continued to worship with us regularly during the summer months. It isn’t that they are afraid of the weather (and let’s face it the time of year does not matter at Mount Zion – it can be snowing in April or blowing a gale in August. They are members at Salendine Nook Baptist Church, Huddersfield and their Church has an afternoon service in winter and evening in summer. Thank you for your presence you are always welcome and are now certainly part of Mount Zion. Having a curiosity for local knowledge about history, geography and customs of local places especially Halifax and its Methodist roots, I had for my history exam to research and write a 3000 word essay and I chose the Rev. John Wesley, knowing quite a lot about him from my childhood, Sunday School days, and through my life in Methodism. I went on to the website and brought up Mount Zion. Where was this chapel? Firstly I visited the Octagonal Methodist Chapel in Heptonstall, a place I know well, and a chapel I have visited on previous occasions, having friends who live in the village. This chapel it was said, was built in the shape of an octagon so that where were no corners for the devil to hid, but recently I have heard it was to benefit the acoustics, perhaps someone may be able to clarify these points! During one visit to this chapel I stayed for the service. Afterwards the Minister asked me if I was a tourist. He seemed disappointed when I informed him I lived in Halifax. This I later confirmed when a few days later I bumped into him at the local supermarket, whilst he was packing his bags at the checkout. He gave me a cheery wave and was off – what a small world. One Sunday in May 2002 I went as usual to the morning service at the Chapel where I am a member and included in the notices was information about John Welsey and Mount Zion. After the service I decided to find this Mount Zion. I was greeted by Trevor Hoyle as he was dashing up the chapel path and Una Gill who duly introduced me to Irene Cunliffe. I was invited to stay for the service and afterwards was given a personal tour and history lesson on the Wesley brothers. I came away armed with leaflets, a copy of “The Dial” and a porcelain Mount Zion beaker – since that Sunday I have become a regular. One of the most joyous occasions was the Tercentenary celebrations last July. What would John Wesley have thought? Another fun time was when Irene Cunliffe had a Sunday off and Stuart McArthur, who sits in front of me, told me to sing up. When I told him to do the same he informed me the only singer in his house was the old sewing machine. The other occasion was last summer during the silence of prayer a mousetrap went off. This amused Una and me greatly, especially when we were told that they were “great big fat ‘uns” so even Mount Zion mice are contented. Sunday by Sunday as I study the portraits of the Wesley brothers I ponder as to whether I have been lead, like them to this unique Mount Zion, with its equally unique congregation? With best wishes from pew 37. EMINENT PEOPLE . . . .
Freeman, Hardy or Willis I am talking to?” On returning his call I found out that the headlines in the local paper had been “Freemen of the Borough” and my photograph was there for all to see. Apparently twenty new Honorary Freemen were to be admitted to the Borough to celebrate the new millennium. These were the first Freemen to be admitted since the Borough of Calderdale was formed. And I was to be one of them. A ceremony was held in May 2000 at the Victoria Theatre. A procession headed down the aisle lead by the Mace Bearer, the Mayor and other dignitaries. We all followed on, with me and little Alice my guide dog, bringing up the rear. As we made our way to the front of the theatre, trumpets sounded and Copeland’s “Fanfare for the Common Man” was played. It fair made my chin wobble. With my knees knocking I was escorted up on to the stage accompanied by Alice tail wagging ten to the dozen. Proper little poser she is! I received from the Mayor a beautiful scroll which showed I had been admitted as an Honorary Freeman of the Metropolitan Borough of Calderdale in recognition of eminent service to the Borough. Our names were also chiselled on to the marble wall in the Town Hall under the previous list of Freemen of Halifax. All were in Alphabetical order except mine! Knowing I could not read the list and being small of stature my name had been included at the bottom of the list so that I can reach up and feel the inscription. Nice touch eh! This was all pretty embarrassing at the time. However I was invited to become a Freeman of England and Wales and since then I have travelled all over the country and been proud to represent and promote Calderdale. It has its amusing moments too, like the first time we paraded through the streets of Newcastle and little Alice, in Guide Dog mode said, “Never mind if the chaps with the scarlet jackets and bearskins, making a din, want to talk in the road, your place is on the pavement” and that is where she was determined to take me. Then there was the first banquet we attended where we knew no-one and no-one knew us. After the toast to the Queen, the chairman started his speech by telling how his committee had met with the Maitre D’ the night before and spent two hours trying to find why the numbers did not add up. He then realized that a place had been set for Alice McArthur not knowing she was a Guide Dog. Needless to say she is now quite famous and wherever we go she is greeted first by friends old and new, then as an afterthought they shake my hand. We have been to many special services at various cathedrals and churches but it is always nice to come back to our little chapel – Mount Zion on Ogden Moor. Freemen go back hundreds of years and may be in a later edition we can look at some of the history. Meanwhile Calderdale Talking Newspaper is 25 years old this year and is celebrating with a concert at the Victoria Theatre. As a founder member I don’t know where the years have gone but am still helping to produce the weekly news cassette so that the blind can keep up to date with all the local news. I still find myself with speaking engagements and any funds raised go to the Talking Newspaper or more often these days to the Blind Children’s Fund. This enables visually impaired children to have extra help with their education such as talking dictionaries and talking calculators. As there are over 120 such children in Calderdale this fund constantly needs topping up. But that is yet another story ….. The fellowship meets the first Thursday of each month until november 7.30 p.m. at the homes of members. Saturday 26th June – methodist conference begins at loughborough university. At the opening of conference rev. Will Morrey will become the president. It is a great honour to be president of conference and for will also a great personal achievement. Irene and kath Melling are hoping to be present at that service. Please remember Will, Vicki, Peter and Adam at that time. We are hoping that Will is going to preach at Mount Zion during his presidential visit to the West Yorkshire District. Sunday 4th July – anniversary reunion. Service at 2.45 p.m. when we hope that the Rev. Derek Hoe will be the preacher. Saturday 18th September – Concert at the Victoria Theatre for 25 years of the Talking Newspaper. He weathers the weather, whether or not. Thanks to Mary Dixon for the above. From MOUNT ZION we send you all our greetings and hope you will have a good summer and that we will see you at Mount Zion sometime. In the present day world of conflict and the ongoing war in the Middle East we pray for peace and the desire to live together in harmony.